I am writing this letter to any organizers of group cultural travel who are contemplating a trip in the Caucasus (Georgia, Armenia and Azerbaijan). I have just returned from a wonderful trip that was organized for me and a group of sixteen of my clients. The trip was put together and managed locally by John A. Graham and was a version of his Monastery Tour specifically crafted for our group and its interests in art, culture, and built environment. John and I worked for three years to make this trip come to fruition, beginning with a brief familiarization trip that I made in 2011. John and colleagues in his organization took care of all the local details from planning itineraries to hotel bookings, ordering meals, local transportation, with great skill and mastery, often anticipating wrinkles before they became apparent. During the running of the trip, he took full charge of all aspects of the trip, including anticipating the individual needs of our guests and interacting them and fostering a most congenial spirit of camaraderie amonst the group. Our trip included a few days in Armenia, and there John was able to locate the most perfect local manager for our tour, and the two of them worked hand in hand to the ultimate benefit and satisfaction of our group. In addition, John's passion for and knowledge about his adopted country, Georgia, enabled him to offer our guests a vivid and personal window into that country's history, culture, religion, cuisine, and viniculture. Along the way, he brought in friends and colleagues, including masters in liturgical chant, who performed for us in the various churches we visited, and a master wine maker and restaurateur, who invited us to a wine tasting and gourmet dinner of Georgian specialities. I am confident that there is no other individual or organization capable of offering the same level of expertise and responsiveness to the needs of any group as is John Graham. I will be happy to speak with anyone planning a trip to the region to go on about my enthusiasm for it as well as admiration for the expertise of John. Sincerely yours, Stephen H.
I write with a strong endorsement for the services of John Graham, who organized a splendid 6 day tour of Georgia for the Caucasus Nature Fund in May of 2012. Our tour combined nature, cultural and culinary tourism, and benefitted from John's knowledge in these areas at every stop of the way. We are a nature organization supporting Georgia's national parks. Yet John was as familiar with the trails, guides and pleasures of Georgia's world class protected areas as we, and added value even in our own area of expertise. 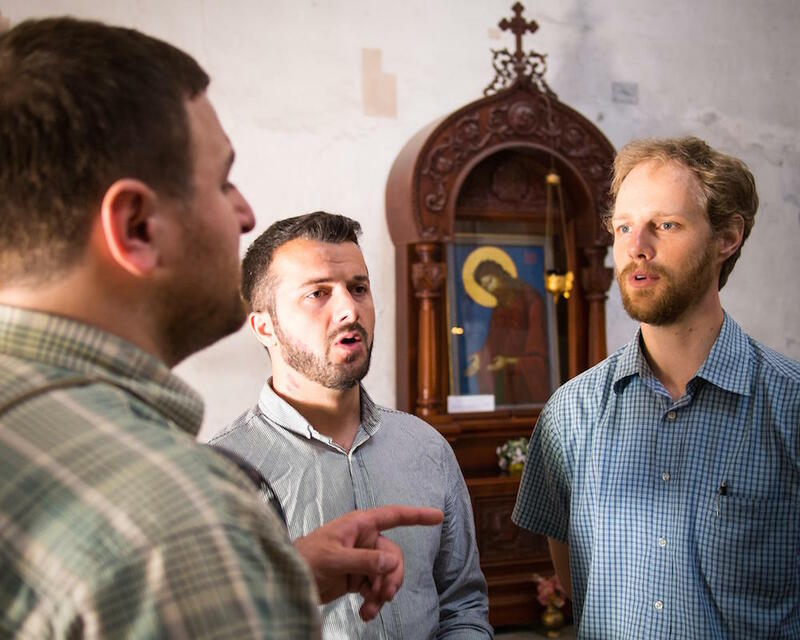 John is a leading expert on Georgian chant and its relation to religious history, so our trips to the monasteries and churches, frequently accompanied by chant demonstrations, were unique. Finally, John knows the traditions and quality of Georgian food and wine and has ccess to the country's leading chefs and winemakers. So the stunning but sometimes severe beauty of the great outdoors and the peace of monasteries were nicely balanced by the exuberance and sensual pleasures of the Georgian table. John has an attention to logistical detail and a sense for how much can sensibly be planned in a single day--important qualities to planning any group trip. While our group was more than 20 people and we had the benefit of a travel agent as well, John's support added a personal touch, unusual local knowledge and an ability to communicate it. These made the difference between a sight-seeig tour and a personalized, insider's perspective on a country with multi-faceted and richly layered attractions. Sincerely, David M.